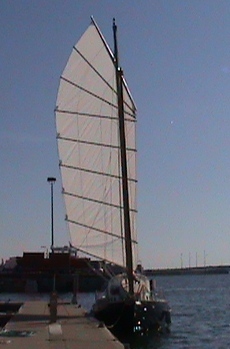 At last the main sail is on the mast. Since this picture was taken I have added the Yard hauling parrel and Luff hauling parrel – although they make little difference to the appearance or shape when the sail is not working. I have decided not to extend and sheet batten number 2 (second from Yard) although I have seen this done in pictures of other modern Junks. The extra sheeted batten would introduce a more complex sheeting arrangement with possible issues of undesirable twist when hard pressed. This is something I may experiment with when I have more time but right now I’m focused on getting both sails up and running and ready for a sail to Newfoundland, then Ireland. The foresail has been sown and is connected to its Yard ready for battens to be fitted. Will update with a picture in a few days. This entry was posted in alberg 37, junk rig, junk sail and tagged alberg 37, junk rig, junk sail, schooner, schooner junk. Bookmark the permalink. I just stumbeled over your blog via thea link in the Yahoo JR group. I think it is a good idea to add those yard and luff h. parrels. 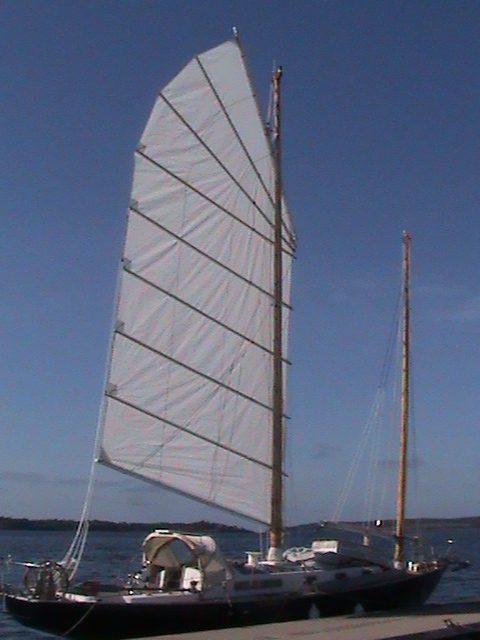 They may not seem to be needed with full sail set, but with 2-3 panels reefed and with the boat pitching, those parrels are good in taming the yard . and top of the sail.